Tough Mudder Supports Charitable Giving. Use the pain to do some good by raising much needed cash for a worthy cause. We strongly urge Mudders to raise funds for our amazing charity partner Help for Heroes but understand that you may already support a cause close to your heart. So why not get friends and family to slap down the plastic to sponsor you in aid of one of our other great charity family members? If you have your own place to run a Tough Mudder, run for Help for Heroes or check out the Charity Listings to find a cause you care about. If you are looking for a charity to run for, why not see if you can get one of our Charity Family's golden tickets in return for some fundraising? Mudders forget their course time and help their fellow Mudders complete the course. Fact. That's why participants have raised millions for charities around the world. Make your Tough Mudder legacy live on by changing the lives of those who really need it. You up for the challenge? NEED FUNDRAISING PLACES FOR YOUR CHARITY? ...All I have to say is it is an experience of a lifetime. 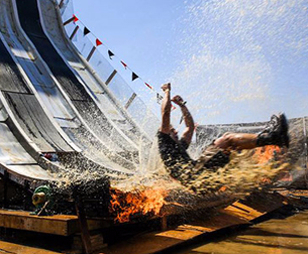 Check out the charities Mudders can raise money for. "The teamwork and camaraderie out there was amazing."